I am not sure where this recipe comes from originally but I have a couple of friends who make this on a regular basis and it’s delicious. 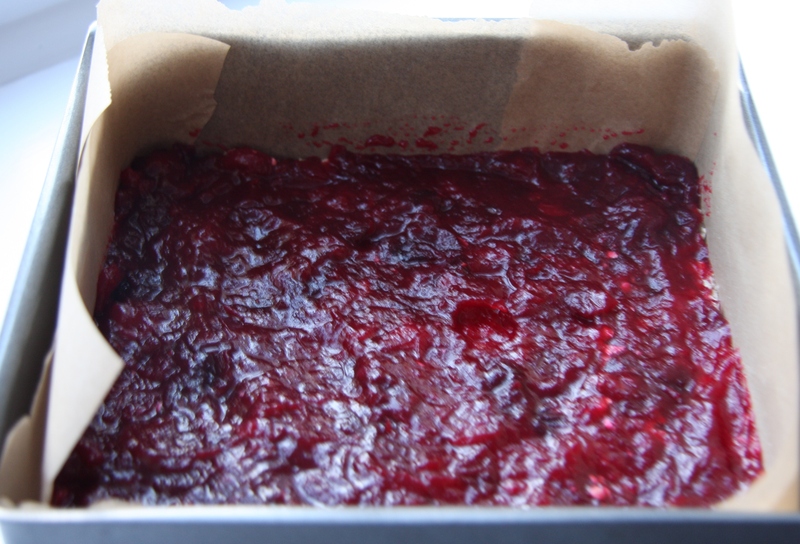 The middle layer uses homemade or store-bought cranberry sauce but you could also subsititute your favourite jams. 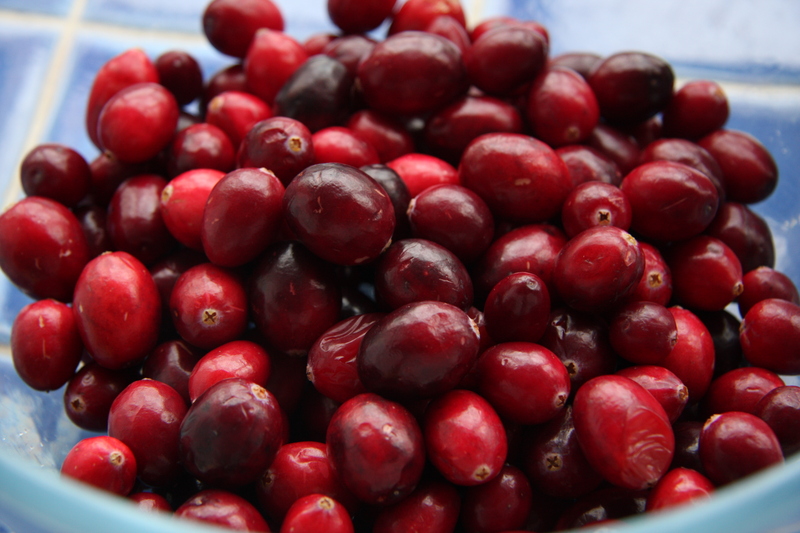 It’s perfect for this time of year as there are fresh cranberries in the shops for Christmas. 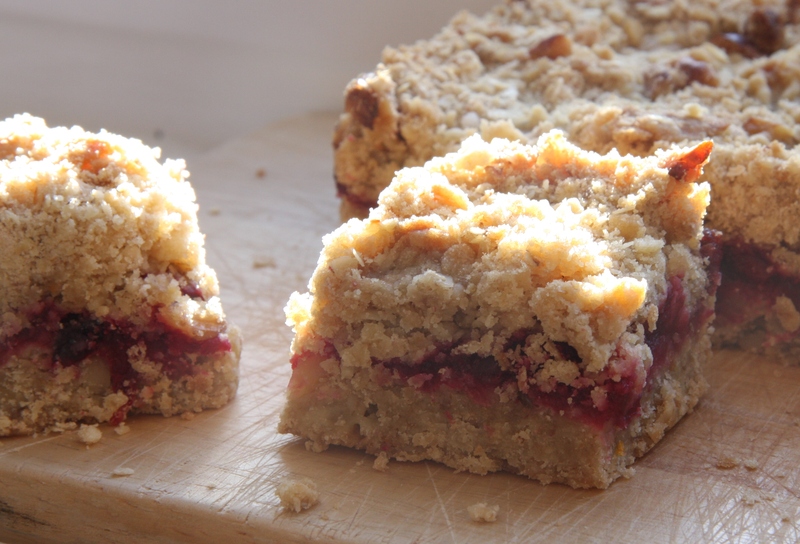 It is essentially a crumble cake bar and I thought it would make a good snack for after “The Grim” this weekend, an 8 mile run over the army vehicle testing ground in Aldershot with a lot of very deep, very muddy puddles. This is the second time I have done it: last year I ran it with my friend Frin who is currently sailing around the Mediterranean. This year I ran it with our mutual friend Karyn. Somehow there were only 2/100ths of a second between last year’s and this year’s times! 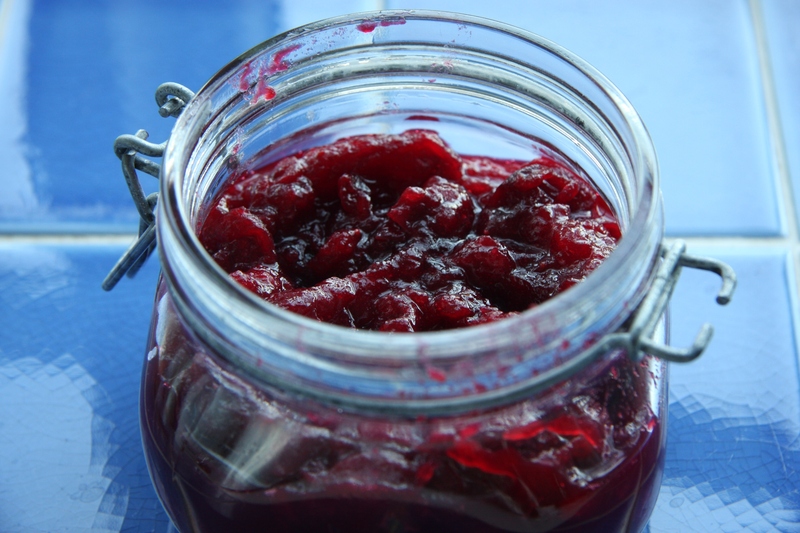 Cranberry sauce is very quick and easy to make. I have made it in the past with red wine but I find the taste far too strong so prefer to stick to orange juice. Even with the added juice and sugar it is still very tart: use it for your Christmas meals and in desserts as well. Heat the orange juice and sugar in a saucepan so that the sugar dissolves and it comes to the boil. Add the cranberries and continue to simmer until the cranberries start to lose their shape and sauce starts to thicken. This should take up to 10 minutes. When it is ready it can be kept in a sterilised jar and should keep in the fridge for at least a week. 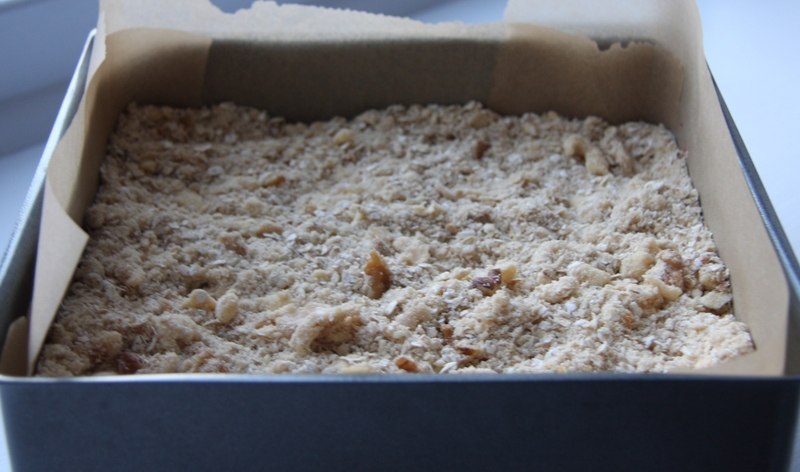 Set the oven to 180ºC and line a 9″ square tin with baking parchment. Put the flour and oats into a large bowl. Chop the butter into cubes and add to the flour and oats. Rub the butter in with your fingers or cut it in with a knife until it is well distributed and a coarse crumb consistency. Mix in the sugar, orange zest and chopped walnuts. 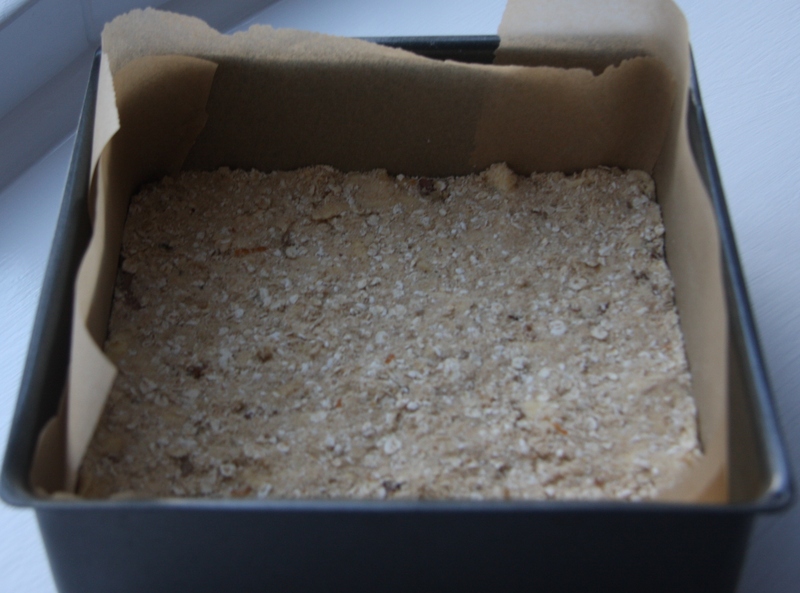 Tip half of the mixture into the tin and press down firmly and evenly with the back of a spoon. Finally sprinkle over the remaining oat mixture and level it without pressing it down. Bake for around 30-40 minutes until nicely browned on top. Leave in the tin to cool for about half an hour and then remove and leave to cool completely on a wire cooling rack before cutting into squares or slices. You could of course eat this warm as a dessert. That’s Karyn in the pink – you’ll find her looking far more sophisticated (and clean) on Frin’s blog. I haven’t booked my flight to see Frin yet but after this weekend I am even more determined to organise that! Hope there is a second batch in 2 weeks time! Might have a go myself. Well done on the Grim. Thank you – will be bringing cranberry sauce! My husband wants to do The Grim next year…you’re all nuts!!! Good luck to him – did you see the picture at the bottom of the post? It’s very muddy!!! I did!!! 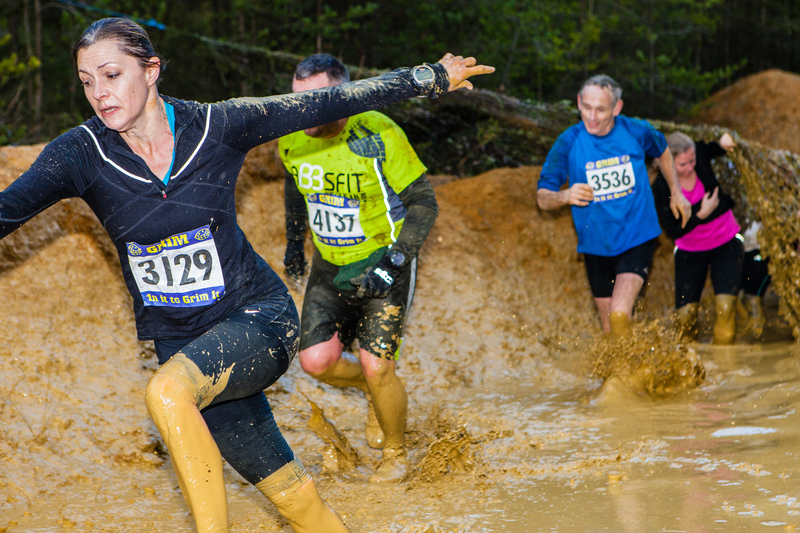 He’s done Survival of the Fittest a couple of times…muddy is nothing new! If I do it again next year no doubt he will speed past me! I have a bag of frozen cranberries now and I haven’t thought of what to do with this..This is a great idea! Hope you enjoy it, thanks! These bars sound really delicious. 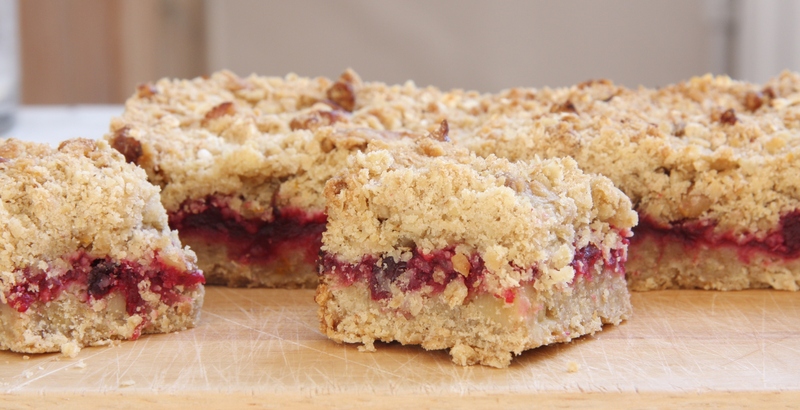 Your weekend reminded me of that cake you made and blogged about last time. Only this time it was you, and not the pigs, in the mud :). Gave me a giggle! I don’t know why I didn’t think of that myself! The pigs have the right idea though, they are much more relaxed!! !